so today when i woke, i thought to myself, "i will just put on my new paisley headband, and i think that will make me feel better." and it has so far. the paisley makes me happy, and the headband makes me feel like a little girl again. 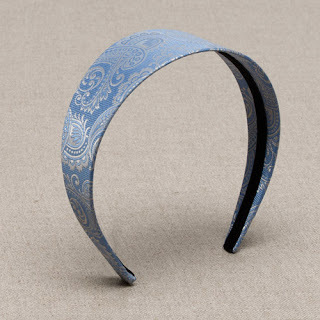 so, doctors may tell you rest and fluids and antibiotics, but i tell you, all you really need is a j.crew paisley headband. sometimes accessories are the best medicine. You didn't. I was the one bothering you about the blog, unless Kate was too...and you. You. you. you. I miss my Lou lou lou. and want to see her pretty writing! and pics and stuff!